Yup, I won the Best Related Book Hugo for Your Hate Mail Will Be Graded, and as you can imagine I think this is very seriously cool. Best novel went to Neil Gaiman for The Graveyard Book, which I think is an excellent choice, and Best Dramatic Presentation went to Wall-E, which is again not terribly unexpected. I am pretty buzzed with happiness at the moment. Now to sleep, an autographing session in the morning, and then travel all the rest of the day. The whole Hugo list is below. See you all tomorrow. Having read “Shoggoths in Bloom” I can honestly say she earned the Hugo. Yeah…really liked “Shoggoth’s in Bloom”…also Exhalation. I’m somewhat astonished that the best novel Hugo didn’t go to Anathem. Now you need to take up painting, so that you can continue your quest to sweep the entire list of possible Hugos. Hm, I think if he hooked up with a great artist, taking the Graphic Story category would count. Perhaps a call to J. H. Williams? Having just re-read Your Hate Mail, I can see why it won. It’s simply brilliant. Here’s to Hate Mail 2:Hotter and Nastier – The Second Decade. And there was much rejoicing in the land of the Whatever. And can I also say just how pleased I am that Ted Chiang won for best short story? I don’t know where he gets his ideas, but I’m thankful he’s willing to go there and drag them back for the enjoyment of the rest of us. If you win enough of them you can paint your ceiling with stars and hang the hugos under them. Your very own Hugo diorama. And Charlie’s streak goes on…. This thread is worthless without headcrabs. I had planned on asking you which Hugo you would target for next year, but I see from the comment thread that graphic story should be your next category. 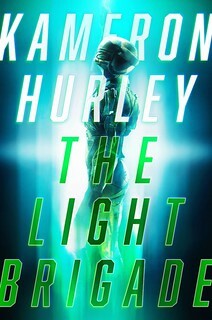 Don’t worry – photoshopping is allowed, you just have to write a story to go with the cover you already have. Keep it up! Congratulations are in order, I think. Not sure what to add on top of those people commenting before me but congratulations anyway! And may there be many more awards to come. You won a phone? Wait…it’s the Coke Zero. We all know how much you like Coke Zero. Congrats, John. That’s a might pretty rocket you got there. The rocket itself is lovely, but I encourage fellow readers to also find photos of the base, which is different for each year’s awards. (I am sure photos will turn up online at some point.) This year’s base is amazingly cool! Congrats John – we are all happy for you! That’s a serious award. Like, you could fend off a home intruder with that thing in a pinch. Congrats on Hugo #2. Now instead of just an award, you have bookends! Congratulations, Mr. Scalzi! Keep it up! It makes me feel like a good person to be so excited for another’s success. Go me!…and you, of course. Congratulations! Rock out with your, uh, Hugo out. Well, congratulations. Love the title on that book. Congratulations. Now… what the hell is the difference between a novella and a novelette? word count. Novelette is 7,500-17,500 words, novella is 17,500-40,000 words. I only just recently got around to reading Old Man’s War…I’m glad I still have before me the fun of first readings of your other ones! how is the Rocket to get to Ohio? Congratulations. I must say I was hoping for Rhetorics of Fantasy to win, but “related book” is such a broad category, and your book was so different form Farah’s as to be an apples and oranges situation. So in that case, a really great won, and I’m happy. That said, Wall-E was not really that great, and something else, almost anything else should have won. Please remember to pilot your rockets responsibly. Do not attempt to drink and park in orbit. As noted under section 1D of our joint overseas venture, the offer stands. The Offer: Seven flats of imported Japanese Coke Zero for the Hugo rocket. I’ll return it as soon as the replica is made at my friend’s machine shop in Milwaukee. Three days, five tops. Man, oh man! We’re going to make a fortune at JapanCon, like five-hundo a pop for the Hewgoes (that is, if the Japanese fans don’t notice the . . . er, “typo”). Anyway, you can probably buy a Coke Zero Machine with the lion’s share of the profit! The offer expires in thirteen minutes . . . Kudos and other granola snacks to you! Congrats John!!! You continue to amaze me…I love you! Last night I read your Hugo tweet and though “Excellent!” because I enjoyed Zoe’s tale. Then I read Neil Gaiman’s tweet about winning a Hugo and I was confused until I remembered Hate Mail was up for an award as well. Excellent for everybody! Now I have to go read Your Hate Mail Will be Graded. Congratulations! Congratulations. Just remember that under the unpublished secret rules of SMOFdom you can only get 2 more Hugos before we cut you off. Pace yourself. Congrats on your big shiny rocket! @ # 64, or we name the award after you, like the (possibly retired) Dave Langford Award For Best Dave Langford, which Scalzi helped de-rail. So now that you’ve sat out a year in the Fan Writer category, do we get to nominate you next year? Or do we have to wait until Dave Langford wins again? Srsly, congrats again on Hate Mail. And to Cheryl Morgan for Fan Writer! Congratulations, John. Hope the sales go up, too! Re #39… Oh good lord, Hugo bookends might be just the most awesome thing ever. That’s going to make one hell of a medallion. Congrats! I think you need a make a special hat that will let you wear that one when you go jogging or mow the lawn or something. Congratulations, Mr. John! Most awesome. Congrats, John! You were smashing! Congratulations! I’ve enjoyed it so far. And hearty congratulations to all the other winners as well! And “they” said this blogging thing would never get you anywhere. 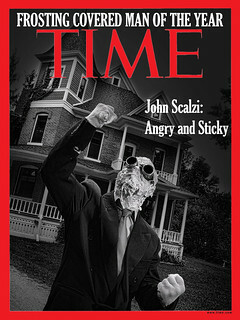 Congratulations, Mr. Scalzi on a fine rocket for a very excellent book. Fantastic rocket! Congratulations my man! 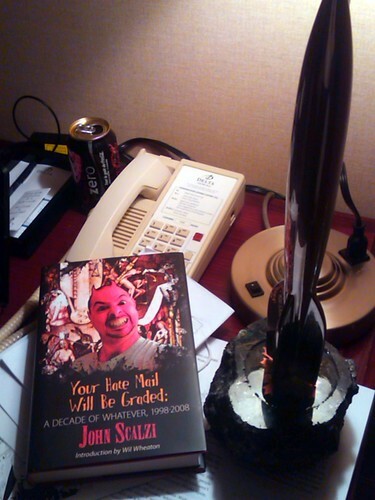 Scalzi cleans up good, I must say…. Congratulations John on your Hugo! Awesome. It was indeed very neat to meet Neil. Well I guess you are the real deal now dude, better start looking for reinforced shelving. So how many Hugo awards must you win before we, the loyal fans, can start calling you Hugo. Hugo Scalzi. Nice ring to it, no? Congratz Mr. Scalzi!